Discussion in 'Online Casino Promotions' started by Marina, Feb 1, 2019. As we near the end of the month, we are already seeing online casinos starting to don their hearts on their sleeves. Yes, it’s nearly Valentine’s Day and you can be sure to find promotions that you will truly love! Two awesome online casinos, namely 24VIP Casino and Superior Casino have fired the first arrow from Cupid’s bow and have announced a new promo that will certainly warm your heart. The great news is that you don’t have to wait until February 14th 2019– Valentine’s Day – to start winning. These online casinos will run their Valentine’s Day promotion from February 1st until February 15th 2019, giving you enough time to haul in those rewards. So what does the Valentine’s Day promotion at Superior and 24VIP online casinos entail? The offer includes a 180% match bonus as well as 100 free spins. That’s right – two great offers in one super promotion. What’s not to love about this deal? The other good news is that the offer is open to new and existing players! So whether you have just opened an account at one of these online casinos, or you’re a loyal player on one or both of these platforms, you can claim the offers. We can’t think of a more appropriate game than Rival’s love-themed slot game, For Love and Money to feature as the slot game in this promotion. This is the ideal game where you can just cuddle up on the couch and play the most romantic title in town. This game has the whole package – a dashing young hero who fights off the villains to save his delightful damsel in distress. Even before knowing this game’s title, there is no guessing its theme. From love birds to Cupid, and from flowers to love letters, this game is simply jam packed with everything you need for a Valentine’s Day treat. Writer Wild symbol – five of which pay out the 5,000 coin jackpot. 2 x multiplier for winning combinations with the wild symbol. Part of the iSlots range which guarantees interactive game play. 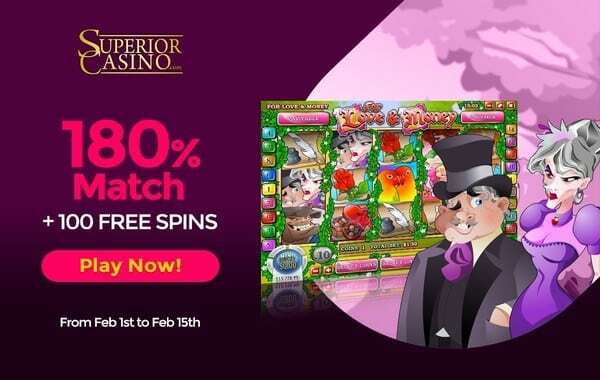 Free Spins Feature for landing three or more scatter Cupids.